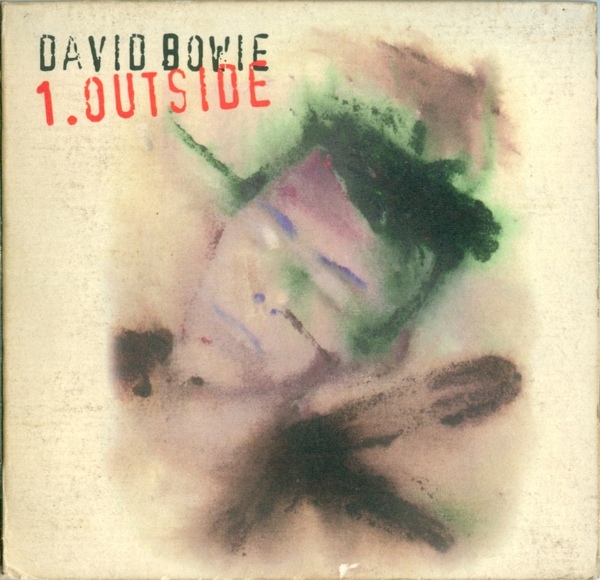 Several months of 1995 were spent waiting for the new David Bowie album, “Outside.” This was it. The big one. The one where he and Eno finally made the 4ourth album of their “Berlin Trilogy.” This one would be the album where he finally shucked the dead seagull of “Let’s Dance” that had been a perceivable drag on his movement forward for a dozen years. I could not wait for this album! Like any fan, I had to. It would not be released until my birthday that year. My fiancée’s friend, Susan, would give it to me as a gift at my birthday party that year. I was chomping at the bit to actually hear this long-imagined Eno-Bowie teamup; the first since 1979. As it turned out, I could have waited another 16 years. Subtitled “The Nathan Adler Diaries: A Hyper-Cycle” only illustrates how the top-heavy, yet dated conceit of murder as art in 1999 bogged down the entire conception of the album. To say nothing of the narrative conceits [such that they existed] and character soliloquies that brought the proceedings to a screeching halt whenever they occurred. The songs and vibe were very dubious, and failed to gel as an album. Well, it always was a “gothic hyper-cycle.” Maybe playing the album from start to finish [which is a chore, let me say] was supposed to miss the point? I became only more aggravated with the album after reading about Eno’s backstory/processes that defined the work environment of the album, which was improvised in the studio completely. These concepts were far more interesting than the actual music produced. It’s not a stretch to say that this album vied with “Let’s Dance” as my most disappointing Bowie album going forward, and remember; at this point, I had yet to actually hear “Let’s Dance” in full! In the years afterward, I have come to recognize that many individual songs taken out of the album’s context, are quite good. It’s just the format and “story” which were leaden to me. Even with this disappointment, I made sure that my Bowie-fan fiancée and I had tickets to the album’s tour. We would have to travel to Atlanta, but we did that regularly for much less than a Bowie tour! Bowie + NIN; a match made in an accountant’s dream. By 1995 we were more than over NIN. We had gotten off that tiresome bus by 1993 and by 1995, I had purged the more specious “industrial” recordings from my Record Cell. All five NIN EPs were sold off, as were most KMFDM discs. That sort of adolescent aggro-metal was way past its sell-by date with me. We timed our arrival at the Lakewood Amphitheater to occur after NIN had left the stage. What we couldn’t have known, was that Bowie’s band would share a number with NIN and then take over midway. We had eaten a leisurely Thai meal and were walking from the parking lot when the strains of “Look Back In Anger” caused us to hurry towards the venue from the parking lot; just in time for a mass exodus of NIN fans to avoid seeing the old geezer who had driven their hero, Trent Reznor, from the stage. Seven tracks from the new album, and seven choice deep cuts… plus “Under Pressure.” I was most excited to hear “Nite Flights,” “Joe The Lion” and “Breaking Glass.” My fiancée was impressed with “Andy Warhol,” which was fantastically staged with stroboscopic lighting. I have to admit, that it was nice to hear a setlist without those songs he had jettisoned following the “Sound + Vision” tour. Not hearing “Let’s Dance” was worth any amount of tracks from the new album, though “The Hotel” and “Through These Architect’s Eyes” would have been most welcome to me. This had been a much more interesting Bowie concert than my first even if it had been in an outdoor shed. Given that I had only been digesting the new album for less than a fortnight, it was an honorable performance, even if the linkup with NIN was obviously only for the money. Bowie had triangulated that he would need a big pull to make a tour with his “difficult” new album and no sure-fire hits viable, and post 1994, NIN were a big fish in a big pond. 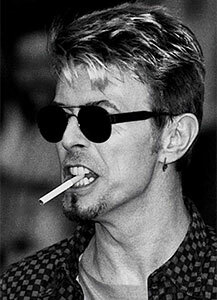 That Reznor was a starry-eyed fan made it all too easy for Bowie to ride his coat tails. Next: …Bowie tries his hand at other genres I disdain! 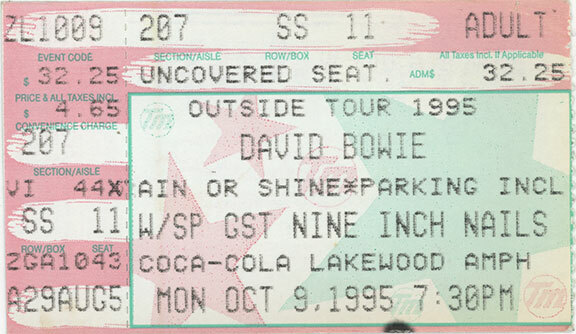 This entry was posted in Bowie, Core Collection and tagged 1995, Atlanta, David Bowie, Live Concerts, Nine Inch Nails, Outside. Bookmark the permalink. I don’t have much to add to your reaction to Outside. You pretty much hit all the low points Monk. I have come to welcome it back into the fold with less disappointment than I had 20 years ago. I think it’s an album that has more written about the process and backstory than anyone has ever given to reviewing the songs. Now the tour was a different matter. It was Bowie stadium tour #3 – three in a row actually – and my friends and I managed decent seats at Giant’s Stadium in NJ. We sat through NIN and were more interested in the enormous number of NIN fans there than the music. Once Bowie got to the stage, the prior 45 minutes were a distant memory as Bowie’s set was scorchingly great! It seemed as though he really meant it when he retired songs during the Sound + Vision Tour and to get Breaking Glass, Nite Flights, Joe The Lion, The Man Who Sold The World and, for me the night’s highlight, Andy Warhol, was really a gift. I remember feeling that many of the old songs fit in well with the new tracks – as would be the intention, so we all went away feeling very satisfied. I haven’t heard Outside in a long time; high time for a re-consideration. I’m always a little dismayed when the production on a record kind of overwhelms the songs, and so Outside — while I could see a lot of great songwriting underneath it all, the production as I recall was something of a bludgeon (not unlike a certain Duran Duran record, among others). Some would say the same about Earthling, but somehow that one works for me, whereas Outside originally didn’t, though in both cases later hearing of the songs in other contexts really opened up how good they were. As a break from the path he had been on in the early 80s, Outside was very welcome, but as an album it doesn’t quite gel. I have to say I love Outside…even the silly voices! Would love to see a two disc deluxe with the additional material that was discarded. It just clicked with me at the time for some reason. Saw one of the Wembley gigs on this tour, with Morrissey as support (that ended well…). Loved the gig despite the rubbish seats we had. The weird thing was that it wasn’t sold out and the press in the UK ran stories about people leaving early because of the lack of hits played! Bizarre.